It’s dusk and Robert Hermann is driving an eighteen-wheeler down a narrow road lined with fields and neat hedges. We’re in the Lower Mainland of British Columbia, and the silhouettes of the Coast Mountains loom on the horizon. As the truck passes farms and barns, Hermann, sixty-one, rolls down the window and inhales—animal manure and moist dirt. “Smells like money,” he says, and laughs. Hermann has been driving trucks for thirty-five years. He’s carried tomatoes and gasoline and wood chips and firehoses across the continent, BC to Louisiana, Los Angeles to Toronto. On this night in early May, Hermann and a group of other truckers are preparing to haul 110,000 chickens from a farm near Abbotsford to an abattoir in the middle of Vancouver. The birds are thirty-nine days old and it’s time for slaughter. He steers past a sign that reads, “DO NOT ENTER BIOSECURITY IN EFFECT” and pulls up to two long aluminum barns. “I’ll tell you right off the bat,” Hermann says as he manoeuvres the truck, “I hate automatics.” He’s filling in for another driver and he borrowed the vehicle. “I hate it!” he says as it stutters through the gears. A van arrives and a crew of chicken catchers pours out, ready for the overnight shift. They hunch over lit cigarettes, backpacks slung on their shoulders as they wait under the yard light. Hermann gets the truck into position and turns on the radio—he needs to wait until the cargo is loaded. Inside one of the barns, the chicken catchers pace up and down, grabbing birds by the legs and stuffing them into cages. Once the chickens are loaded—Hermann’s taking 5,700 this trip—we spend an hour driving along the Trans-Canada Highway to Vancouver. We arrive downtown, and Hermann expertly steers the hulking truck along a tight alley, through a narrow warehouse door, and into a dusty, high-ceilinged arena. Then there’s a lot of backing up, pulling forward, unhooking and rehooking the trailer. It’s weighed and, finally, ready to be unloaded. Throughout all of these tasks, Hermann talks, telling me about his job and his life. He and his wife have two foster kids to support, and he was diagnosed with prostate cancer last year. His first wife died of breast cancer in 2014. Before that, he worked night shifts so he could care for her—“play nursemaid,” as he puts it—or just nap by his wife’s side during her long, difficult days. Even now that she’s gone, he still works mostly nights. It allows him to have supper with his new “sweetie,” whom he married last year. The screeching of thousands of chickens reaches a crescendo as a forklift operator removes tray after tray of cages. After they’re all out, Hermann hoses down the trailer. Feathers fly in the air as though we’re in the midst of a giant pillow fight. He then swings himself into the truck and settles into the driver’s seat once again. It’s back to the farm for the next load. Hermann is just one of the thousands of truckers who can be found on BC’s roads at any given time. In Canada, more than 1 in every 100 workers is a truck driver, some 300,000 people—it’s the second most common occupation reported by men. In 2010, truck transportation contributed $17.1 billion to our country’s GDP. It’s a similar scene in the United States, where about 3.5 million people drive trucks for a living. Serghei Tulei first saw a glimpse of this future one day in May 2016. Tulei had worked in information technology in his native Moldova, but he got a job as a trucker after he immigrated to the US in 2011. On that day in May, he was driving along the chaotic I-280 freeway outside San Francisco, going about 90 kilometres per hour, and all around him, cars weaved in and out of the eight lanes of traffic. Tulei nervously looked down at a button on the dash that read, simply, “Engage.” He hesitated for a second, then pressed it. Then he let go of the steering wheel and allowed his hands to hover a few centimetres away. He sat back and watched as the truck took over, braking, accelerating, and steering all by itself. Tulei had recently started working for an outfit called Otto, a company that is attempting to create fully autonomous trucks (Otto was acquired by Uber last summer for $680 million [US]). On his first hands-free drive, Tulei was testing whether the truck could stay in its lane. It would occasionally veer across the lines, requiring him to take over (like in any software test, Tulei says, “you are trying to find the bugs”). He drove mostly around the Bay Area, his hands off the wheel for twenty or thirty minutes at a time. His new job, in effect, was to help make truck driving obsolete. In October 2016, a semi with California plates hurtled along the I-25 in Colorado, loaded with cases of Budweiser. It may have seemed unremarkable at first glance, just another of the 2.5 million trucks winding their way along US highways every year, but this semi had no head looking out from behind the dash. The only human on board was sitting comfortably in the rear of the cab. According to Otto, the truck drove by itself for 200 kilometres without human intervention, making the trip from Fort Collins to Colorado Springs the world’s first commercial delivery by a “self-driving” truck. The question is no longer whether autonomous truck technology is possible, but how soon we’ll see it deployed en masse. Some tech company representatives say the new trucks may show up on North American roads in the next year or so. Others are less optimistic. But history is clear on one thing: once these changes start, they can move fast. One needs only to use a bank machine, order a pizza online, or buy a robotic vacuum cleaner to see how automated systems have replaced humans in everyday tasks. The prospect of eliminating drivers recalls the plight of the elevator operator. Tens of thousands of people across North America were once employed to shuttle office workers up and down buildings. It was, for decades, a well-paying job. A 1945 elevator-operator strike in Manhattan showed New York City how important these workers were, as people in more than 1,500 buildings were left struggling with the stairs. Elevator operators were essential to society until, a few years later, they weren’t. Automatic elevators, which were cheaper and could run with little oversight, proliferated in the middle of the twentieth century. The number of elevator operators peaked in the 1950s and then, within a generation, all but disappeared. A 2016 report from the Brookfield Institute at Ryerson University predicted that automation will threaten more than 40 percent of Canadian jobs across all industries in the next two decades. Truck drivers are high on the list, along with cashiers, salespeople, and other jobs in retail. The technology needed to automate a forty-tonne truck is not all that different from that being developed for self-driving cars. Earlier this year, I went to the University of Waterloo and sat in the driver’s seat of one of the only autonomous vehicles that the Ontario government has approved to be tested on public roads: a sleek black Lincoln dubbed The Moose. Eight cameras were mounted on the roof, along with a lidar system, which sends out thirty-two laser beams ten times each second to map the vehicle’s surroundings. The car’s trunk was packed with colourful wires and a computer—the “main brain,” as engineer Michael Antkiewicz called it. Krzysztof Czarnecki, one of the lead researchers on the Waterloo team, works on the machine-learning aspect of The Moose’s software. Machine learning enables computers to learn new concepts by analyzing large amounts of data. “It’s often said that automated vehicles run on data rather than gas,” says Czarnecki. Though it is second nature to many of us, driving is complicated. The human brain analyzes countless bits of information every moment and recognizes what’s happening inside the car as well as outside. Calculations are made, possible scenarios are examined, past experiences are considered, and all of this happens subconsciously as we hum along to the radio. To emphasize the point, Czarnecki shows me photos of difficult circumstances that drivers find themselves in constantly: confusing signs, blinding sun, wintry roads, and obscured vehicles. How would a computer interpret these? Even ordinary objects, such as an empty paper bag on the road, can pose a conundrum for autonomous vehicles. A human can immediately tell that the bag is harmless, but an automated car might see it as an obstruction and come to a sudden stop. Researchers at Waterloo use a version of flash cards to teach vehicle computers about objects they might encounter in the real world. They also gather information from human-driven vehicles and use it to “teach” automated cars about human reactions to various situations. Driving-oriented video games can help too, particularly if they include detailed cityscapes and lifelike pedestrians. Czarnecki tells me that computers at Waterloo are learning to drive using Grand Theft Auto. The Moose is currently operating on what’s known as a level-two system, which means a human driver must be present in order to take control of the car if necessary. In total, there are five levels of automation. Level one is when a specific action, like accelerating or steering, is automatic, but a human controls everything else. Level-three systems make some decisions for themselves, though a human driver is still present, while level-four vehicles would be able to drive themselves under certain conditions and could determine what to do in an emergency even if a human doesn’t take over. Level-five automation is the self-driving future right out of a sci-fi movie—vehicles travelling from point A to point B completely by themselves in any situation. Along with the practical decisions of driving, there are also moral ones that programmers must grapple with. A fully automated vehicle would be faced with difficult choices: what pedestrian to hit if a crash is inevitable, whether to protect its occupants (or, more controversially, its cargo) above all else. Czarnecki also wonders who will be held accountable when an accident inevitably happens. Programmers, Czarnecki says, can’t just write a long list of rules and hope to capture all possibilities, as it may sometimes make sense to break them. He shows me an image of an obstructed lane with visibility to the horizon: there are no oncoming vehicles, but the centre line is solid. Any reasonable driver would cross into the oncoming lane to pass the obstacle. But would an autonomous system make the same decision to break the rules of the road, or would it just wait there indefinitely? Richard Cripps was hauling lumber across Alberta in his semi last year when he heard a boom come from the back of his truck. “It was like a bomb,” he says. A few seconds later, he heard a familiar ding—an iPhone alert: “Tire blowout.” The computer system in his truck had already emailed his boss and sent a message to Volvo, the truck’s manufacturer, which immediately dispatched a technician. The only thing that Cripps needed to do was pull over and wait. Help arrived within half an hour. Cripps told me this story as we drove through the prairies, past pumpjacks, waving fields of wheat, and signs advertising a Gospel Music Jamboree. When I rode along with Cripps, he was hauling two silver tanks filled with 70,000 litres of liquid sugar from a factory in Taber, Alberta, to a Coca-Cola plant in Calgary. Cripps is a third-generation trucker. At forty-two, he has been licensed for twenty-two years and grew up driving trucks with his dad, his grandpa, and his uncles. Things have changed since his dad’s generation was behind the wheel, and Cripps’s truck today comes with a bevy of new automatic features: his seat vibrates on the right or left side if he veers out of his lane, the brakes apply automatically if something appears in his path. Technologies like blind-spot assist, lane-departure warnings, adaptive cruise control, and crash-mitigation systems are increasingly common in trucks. These advances in automation mean that drivers need to do less, and they can help mitigate both fatigue and distraction. In both Canada and the US, electronic logbooks will soon ensure that drivers never go over their maximum allowable hours. E-logs will track nearly every aspect of truck driving: where trucks travel, at what speed, and how long they stop for breaks. 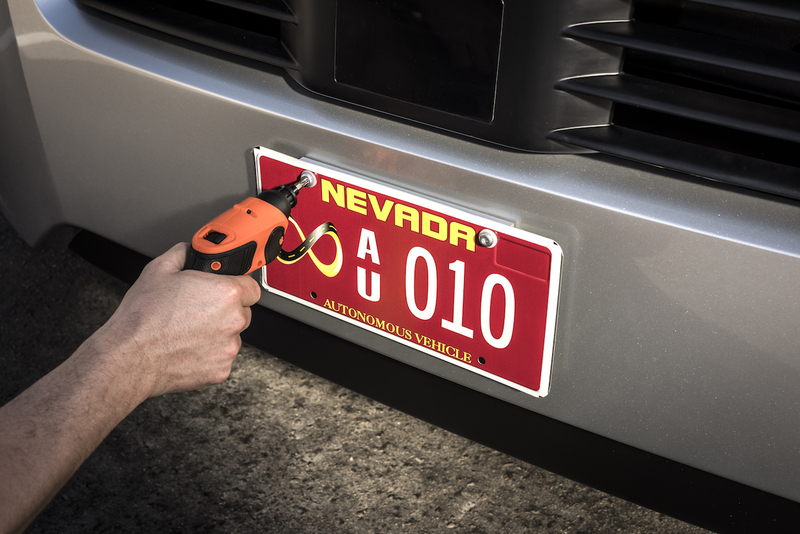 Driving has never been easier—or more outside of a trucker’s control. 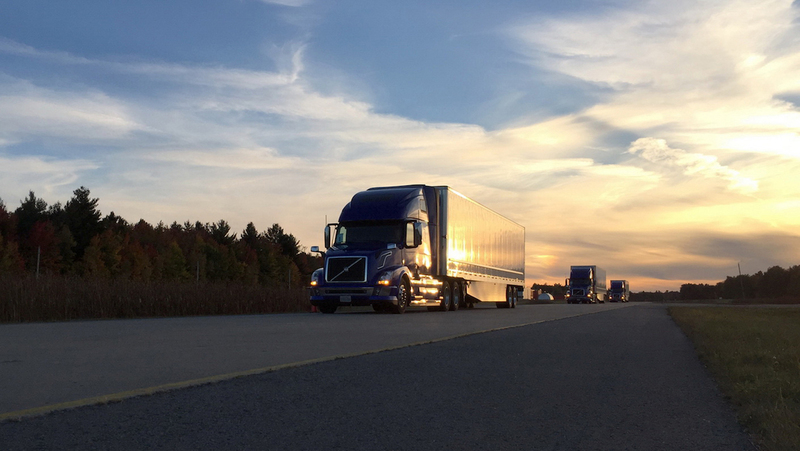 Over the course of interviews with some two dozen drivers from across North America, I heard varied opinions on how new trucking technology actually fares on the road. Shelley Uvanile-Hesch told me how, one night in Kentucky, she was driving her eighteen-wheeler on the interstate when a pickup shot out in front of her—it had been merging and the driver had lost control. Before Uvanile-Hesch could react, her crash-mitigation system kicked in and jammed the brakes. In theory, this system is a useful one: it has a faster response time than humans and can prevent fatal accidents. But physics is tricky. “The next thing I saw was my trailer coming at me on the left,” she says. Her truck was fishtailing—the brakes had been applied too suddenly for the load she was carrying, as the system didn’t take her truck’s weight into account. She just narrowly escaped a dangerous crash caused by a computer’s mistake—one that she says she would never have made herself. Even before that night in Kentucky, Uvanile-Hesch had complaints about the crash-mitigation system. It was “out more times than it was working,” she told me. Problems arose if snow accumulated on the sensor or if there were just “five or six bug splatters.” Uvanile-Hesch, who is forty-nine, has been driving big vehicles her whole life. She isn’t convinced all these technologies work better than an experienced trucker. “They’re just not there yet,” she says. She’s since had the system shut off. Some truckers joked about the looming threat of self-driving trucks, saying that they wouldn’t mind being able to watch TV while their vehicle drove itself down the highway. But after the jokes, many expressed concern about how automation might actually affect their futures. Would they be paid less to “babysit” technology? Would they be replaced by savvy software specialists? Would self-driving trucks result in the complete loss of one of the last decent blue-collar jobs in North America? Nestled at the base of the Cascade Mountains near Hope, BC, is the Flying J truck stop. It’s a hub for drivers travelling along the Trans-Canada Highway and has anything a trucker might need: gas, food, showers. Inside, the walls are lined with big plastic gas cans; Monster Energy drinks are on sale, three for $5. In a TV room, lines of theatre-style seats face a screen showing two bikini-clad women in a wrestling ring tearing at each other’s hair. This rest stop is where I meet Samer Zughib. He’s taking a break, watching a video on his phone of his kids playing soccer. Before he moved to Canada ten years ago, Zughib, fifty-two, worked as an aircraft mechanic in the United Arab Emirates. Now he lives with his family in Laval, Quebec, and works as a trucker. When I ask if he ever thought he’d be a driver, he smiles and shakes his head. “Never,” he says quietly, adjusting his baseball cap. He had started the job just six months earlier, after graduating from a seven-month training program. It wasn’t an easy decision to become a trucker—he doesn’t like being away from his wife and two children. “I’m a family man,” he explains. But Zughib, who previously worked a job in maintenance, made the switch mostly for the money—trucking pays almost double what he was making before. “I changed all my life for this,” he says. The Canadian government reports that the median wage for truck drivers is a little more than $20 per hour—below the average hourly wage in the country but still above the average for those working in sales or service. Drivers told me time and time again that they got into the industry because they thought it was a good job and they wanted to see the country—many romanticized the solitary days spent speeding along the arteries of North America. There are, however, challenges to life on the highway. It’s notoriously hard to find healthy food, and drivers struggle to stay fit. Two separate truckers I rode along with told me they had drank so much Red Bull to keep alert—six a day from coolers behind their seats—that their heart rates raced to 180 beats per minute. Both needed to be hospitalized. The eroding wages and deteriorating working conditions have led to a shortage of drivers. In 2013, the Conference Board of Canada estimated that the deficit could be as high as 33,000 drivers by 2020. The workforce is also aging; just 12 percent of drivers in Canada are under thirty, and drivers are notoriously hard to retain. Bold projections of the near future are typical of Silicon Valley types. Uber says it will usher in driverless taxis soon, and Google’s self-driving cars out for a test are now a common sight in many cities. To many believers, the era of autonomous vehicles has all but arrived. Those outside of the bubble, however, are still debating the timeline. “To get an automation system to be equally safe to a human driver is a huge, huge challenge,” says Steven Shladover. Shladover has been studying transportation systems since he completed his doctorate at the Massachusetts Institute of Technology in the 1970s and has spent recent decades working in the University of California, Berkeley’s Partners for Advanced Transportation Technology program. He points to the fact that there is one fatal crash in the US for every 100 million miles of human driving. By Shladover’s calculation, that’s one death for roughly 390 years of non-stop driving. “Does anybody have a laptop or a mobile phone that’s going to go 390 years without a serious glitch?” he asks. He tells me he’s been working on automating vehicles since the idea was considered “far out” and says that the concept of a self-driving car, while currently in vogue, is not new. Shladover points out that during the 1939 World’s Fair in New York City, General Motors debuted an exhibit called Futurama, which featured miniature models of a future society. In a film about the exhibit, a narrator extols the virtues of the “1960s express motorway,” in which “safe distance between cars is maintained by automatic radio control.” Shladover says that this was the first time the idea of automated vehicles was introduced to the public. When I visited Shladover in his office at a sleepy satellite campus in Richmond, California, a car marked “autonomous” was idling in the parking lot. The program also has automated trucks, but at that time, they were in Blainville, Quebec, where they were being tested as part of a joint initiative with Transport Canada. The goal is to work toward a version of platooning where the vehicles use “co-operative adaptive cruise control” to follow each other closely, thereby reducing drag and dramatically decreasing fuel consumption. For Shladover, all the recent attention given to self-driving vehicles is almost humorous. He says that “marketing hype” has misled the public about how far along the technology really is. Indeed, autonomous trucks may not be as imminent as glitzy promo materials would have us believe. One US state government official told me that videos from tech companies promoting “self-driving” trucks had been staged with green screens, off-camera safety drivers, and police escorts. Companies also made sure that lane lines were freshly painted to make them more easily detectable by the sensors. By Shladover’s reckoning, the gap between a driver being able to take their hands off the steering wheel for a few hours on a highway and fully self-driving trucks that can react to any situation is still a chasm. “It’s at least sixty years in the future before something like [fully self-driving vehicles] become a reality,” he predicts. Siu has studied the decline of what he calls routine jobs—occupations that involve no specialized degrees and centre around fairly repetitive tasks, such as secretarial work or manufacturing. “No matter how you measure it, there’s less work being done [by humans] in routine occupations,” Siu tells me. Today, there are robots that fold laundry, make pizza, and act as cashiers. When I visited San Francisco, I stopped at a coffee shop where a robotic arm made me an Americano, and then I ate at a restaurant specializing in customized quinoa bowls that are made without a human in sight. Nearby, a self-driving pizza-delivery machine was being tested on the sidewalks. A 2013 study from the University of Oxford predicted that 47 percent of US jobs are at risk from automation in the future. This number is expected to be even higher in developing countries. Manufacturing jobs, service jobs, low-skilled labour—all might be on the cusp of major technological change. Graham notes there have been transformations of the workforce in the past, like during the Agricultural and Industrial Revolutions. “Every time before, humans have found new areas of employment,” he says. Graham points out that fifteen years ago, there was virtually no such thing as an app developer. Today, software engineer is the most common occupation in some areas of the US. Twenty-seven-year-old Stefan Seltz-Axmacher, CEO of Starsky Robotics, has been thinking about what the transportation worker of the future will look like. In 2015, he went on a road trip across the US with his college roommate and saw an endless parade of eighteen-wheelers. It was then he decided that the industry was due for a change—specifically, it didn’t need all those drivers. He started Starsky Robotics, and the company quickly raised $5 million (US). Seltz-Axmacher is adamant that his company isn’t seeking to replace drivers entirely—at least for the time being. “We envision a world where there’s a larger office where people work eight-hour shifts remote-driving trucks,” he tells me. In short, he says that this new form of driving will be an office job, like working in a call centre. “They can sit down at their desk, pilot a couple of trucks from the highway to the warehouse, take a bathroom break, pilot a couple more trucks from warehouses to the highway, start feeling a little tired, get up, talk to a friend, sit down, and drive some more,” Seltz-Axmacher says. The bulk of the highway driving, he explains, will be done on autopilot. The office drivers will only take over for the trickier portions of the route: in cities, at warehouses, or if something goes awry. “Since drivers are really only needed for the beginning and the end of the journey, we think that means we could have one driver effectively drive ten to thirty trucks,” he says. It’s 3 a.m., and Hermann and I are back at the Abbotsford farm, waiting for the next load of chickens. Hermann’s colleague Harry Dueck climbs up on the running board and leans in the window to shoot the breeze. Dueck’s been working here for forty-one years. He owns four and a half acres in the interior of BC—his “retirement place”—where he wants to build a house. I ask when he’ll retire, and he and Hermann both laugh. “If I win the lottery, it’ll be this week,” Dueck replies. I ask Dueck how trucking has changed since he started, and he tells me how it used to involve more physical labour. Hermann explains that drivers used to bring the chickens into the trucks themselves, but other workers now do the job for a lower wage. “I used to be much skinnier,” Dueck says. Hermann chuckles. “We’re broadening our horizons,” he says, gesturing at his waistline. By the time the truck is in place to be loaded with its second round of chickens, fatigue sets in. Hermann crawls into the bottom bunk in his cab and offers me the top. It’s a fitful rest. The truck shudders as the forklift operator rams each new tray of chickens into the trailer. The fans on the barns hum, and, somehow, between each jarring vibration, Hermann falls asleep. The loading continues without him, the truck seemingly taking on a life of its own. Sharon J. Riley is an investigative journalist with The Narwhal, whose work has been published by The Walrus, Maisonneuve, Harper’s, and The Tyee, among others.